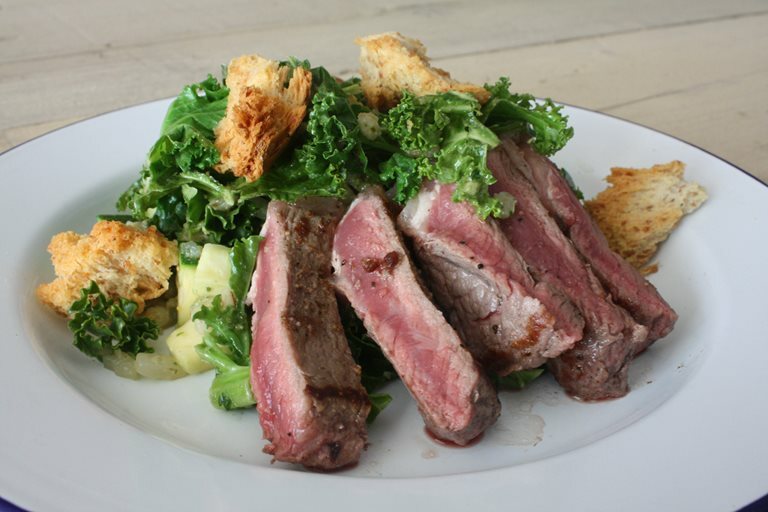 For St Patrick's Day celebrations, Rachel shares a salad based on some of Ireland's best offerings: Irish beef, soda bread, kale and pearl barley ... and, of course, the obligatory Guinness chaser. Did you know that Ireland has the longest grass-growing season in the northern hemisphere? It's true. There are rarely scorching summer days, but there are rarely freezing winter frosts. These wet and drizzling days are a pain for pretty much everyone, except cows. Ireland's 225 rain days destroys espadrilles, ruins blowdrys, and puts a literal dampener on camping trips. But it does ensure beautiful pastures. No wonder that the country's national colour is green. Four fifths of Ireland's agriculture is dedicated to grass. Delicious, nutritional grass, which is feasted on by the country's cows which results in some of the world's tastiest beef. So, to celebrate St Patrick's Day, I decided to treat myself to some grass-fed Irish beef. The temptation with beef is to roll out a Sunday lunch, or the classic steak and chips with béarnaise sauce. Both delicious. But the possibilities are endless. There's oxtail – a somewhat Victorian cut which, which is being revived as more and more people discover the fall-off-the-bone tenderness of the meat in a stew or ragu. Then there's onglet, or hanger steak, which just needs whisking over a searingly hot griddle or barbecue to release the cut's enormous flavours. I toyed with shin, or brisket, or fillet. But on a trip to the butchers it was the sirloin steak which called me. 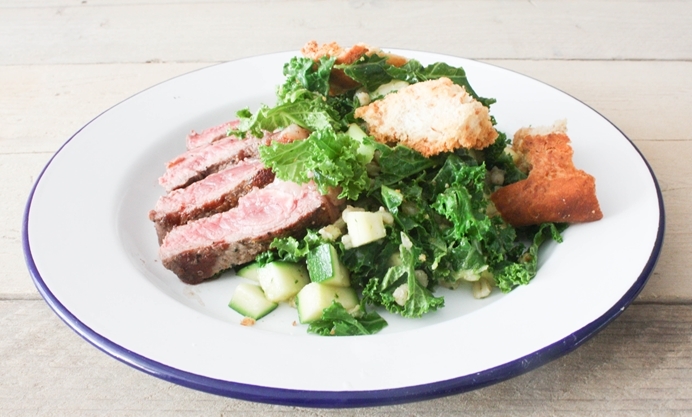 Often steak salads take on a South East Asian bent, but in the name of St Patrick's Day celebrations, I decided that mine was going to take inspiration from some of Ireland's best offerings instead: soda bread, kale and pearl barley...and, of course, the obligatory Guinness chaser.